SINN FEIN president Gerry Adams kept many secrets as he coaxed the Irish Republican Army away from violence and steered it toward a political settlement with the British government and its Unionist allies in Northern Ireland. Some were widely known - that Adams had been a senior IRA commander in the 1970s, responsible for terrorist attacks. Some were known only to his closest political supporters - that while he was quietly moving Sinn Fein, the IRA’s political arm, toward a peaceful compromise, he was supporting IRA attacks against the British and Unionists. But Adams held one secret closely within his family. In 1987 his niece told him that her father had sexually abused her from 1978, when she was 4, to 1983. Adams’s coverup of the allegations against his brother calls into question his political future. The allegations became public last month during a television interview with Adams’s niece, Aine Tyrell. Adams said he believes the allegations. Yet he did did not go to the police in 1987 when Tyrell told him. IRA supporters never did, because they considered the police to be British agents. And, according to “A Secret History of the IRA’’ by Ed Moloney, Adams was then involved in maneuverings that would eventually result in the Good Friday Agreement, which ended the armed conflict in 1998. The Tyrell interview was broadcast a month after a report was issued that denounced the Catholic hierarchy in the Irish Republic for a decades-long cover-up of clerical sexual abuse. Four bishops have resigned as a result. Like the bishops, Adams kept quiet about his brother to protect the institution and cause he served, and like the bishops, he should face the consequences. Gerry Adams, so skillful at political manipulation, ought to have been able to find a way to bring Liam to account, but he wasn’t willing to risk scandal. Despite knowing of the alleged abuse, he was photographed in 1997 canvassing with Liam for a Sinn Fein candidate in the Irish Republic. More disturbing, Liam Adams was able to get a job working with young people in West Belfast, Gerry Adams’s political domain. Gerry Adams allowed Liam to escape a reckoning and move about Northern Ireland and the Irish Republic, much like Catholic bishops allowed priest-abusers to be transferred from one parish to another in the United States and Ireland. After the television broadcast, Gerry Adams revealed he had learned in 1998 that his father, also named Gerry, was an abuser within his family. It is unclear who the victims were, but the younger Gerry Adams does not remember any abuse. The young Adams should have drawn a lesson from this belated disclosure that it is vital to get the facts out so that victims are encouraged to come forward and children are protected. But Adams continued the coverup. The senior Adams died in 2003. More secrets about Gerry Adams are likely to be revealed this spring with the publication of “Voices From the Grave,’’ by Ed Moloney, based on the disclosures of Brendan Hughes, an estranged Adams ally, who died last year. Hughes was close to Adams when he was an IRA commander in the 1970s. The book draws on interviews by Boston College researchers for a project to gather memoirs of participants in the Troubles. Moloney would not say what the book would reveal, but it will surely link Adams to IRA atrocities. Adams and the rest of the IRA leadership put the cause of Irish nationalism and their own ambition above simple human decency, the same priorities he showed when he slighted his niece’s appeal for justice in 1987. 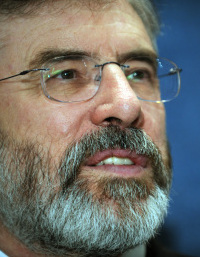 Besides holding the presidency of Sinn Fein, Adams is a member of the British Parliament. Neither position is served well by someone with Adams’s record. He should leave politics and attend to his shattered family. Thomas Gagen, a freelance writer, wrote about Northern Ireland for the Globe Editorial Page.